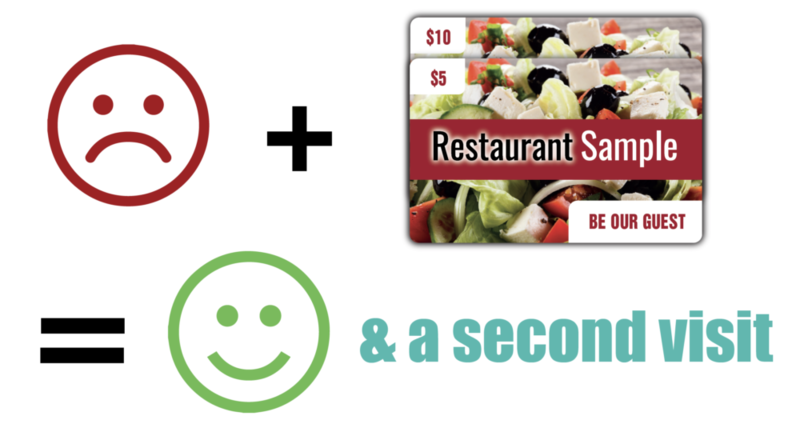 Use gift cards to help satisfy an unhappy guest. A “Be Our Guest” card can be used instead of removing items from the bill, give the customer a gift card and keep the money in the register. A gift card encourages the customer to come back a second time, giving you the opportunity for another chance to wow them and create a new loyal customer. A Be Our Guest card in small denominations can be distributed at community events like farmers markets, street fairs, etc. While a $5 gift card may be enough to incent a customer to come to your business, your cost is just the cost of goods sold which in most cases is less than 1/3 the value of the card. It’s a small price to pay for a new customer that will spend more than the value of the card and most likely bring someone else with them.